I absolutely love the world of food blogging. There's such a great community to be found with it, each spurring others on to try new and exciting things. Ning over at Heart and Hearth tagged me recently for Breadline Africa after making some moist pumpkin quick bread for the event herself. With our support, Breadline Africa can convert shipping containers into locations for food production and distribution to the poor people in South Africa. These sustainable community kitchens will not only provide foods such as bread and soup to those in need, but also opportunities for skills development within these poor communities. So, they are not only aiming to give them bread, but also to teach them skills so that they will be able to earn their own bread as well. Breadline Africa launched the Worldwide Blogger Baker Bake-Off Challenge aiming at raising $ 1 M in funds. This bake-off gives us baking bloggers the power to make a difference in this world. What do we do? Bake bread. Give Dough. Feed Africa. Vals says, "You can sign up for the campaign, make a donation, upload your bread recipes and document your culinary adventures in the media center to spread the word. You don't have to donate money but simply just mention the campaign and create awareness." 1. If you are tagged, copy and paste the rules into your post. 2. Bake bread, do something you wouldn’t normally do, and blog about it. Upload your picture and recipe. 3. Give dough, donate to Breadline Africa and help us end poverty. 4. Tag five bloggers, and ping us so we know you’ve done so. It turned out that when Ning tagged me for all this that I had been craving some fruit loaf but resisting to buy any. Then at J's funeral there was fruit loaf and then a few days later in planning for a Christmas Eve service for church fruit loaf was mentioned again. I had a look at my online bookmarked recipes and there was a link for Delia's Irish Tea Bread which I just happened to have bought all the ingredients for in preparation for making Christmas cake and decided that I really was destined to make some fruit loaf. Delia says on her site, "It's always hard for me to believe that this simple little fruit loaf can taste so good. When we were testing recipes, this one disappeared the fastest – none of us could resist just one more little bit. It's good all by itself or spread with butter, and it's quite brilliant toasted." and I have to agree 100%. This bread was so simple to prepare and utterly delicious, I couldn't resist a slice shortly after I took it out of the oven and it was divine. I'll definitely be making this one again. In fact I may make the 2 that Delia makes in the original recipe and freeze one like she suggests! This time I only made the one, so here's Delia's recipe halved and only very slightly adapted. This recipe is taken from How to Cook Book One and Delia's Vegetarian Collection. 1. Line a loaf tin with parchment paper. 2. Place all the fruits, including the candied peel, in a bowl, then dissolve the sugar in the hot tea, pour this over the fruits, cover the bowl and leave it overnight so the fruits become plump and juicy. 4. Add the beaten egg mixture to the bowl containing the fruits and add the cherries. 5. Sift in the flour, and mix well. 6. Pour the mixture into the prepared loaf tin and bake in the centre of the oven for 1¼-1½ hours, until they feel springy in the centre. 7. Loosen it straight away with a palette knife and turn out on to a wire rack to cool. I've also been tagged for various awards recently too, which have really meant a lot to me and encouraged me, but I've lost track of who all has awarded me things since I got my new computer so sorry to any I haven't blogged about. 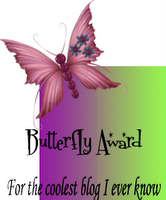 However, Dell awarded me The Butterfly Award & The Perfect Blend Of Friendship Award. Thank you Dell!!! Funnily enough.........I've just seen a bread recipe that looks like a type of Challah on a Slovakian food blog site, and think I'll have to go shopping for the ingredients next week. What a good and worthwhile excuse to get baking!!!!! BTW, when I first made the Delia Teabread I wrote one word beside the recipe. I love heavily studded loaves like this... Just a thin slice and I'm satisfied. I can't believe it. I've lost the photos of my stollen. Can I still post it? I really made it, honest! English Mum, I believe you, blog away! This tea loaf looks delicious...they are easy to prepare too.I am going to make them. My family loves such kind of loaves.